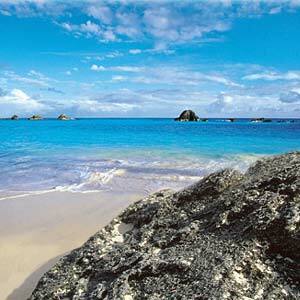 Bermuda, the name conjures up images of wonderful beaches, lazy holidays and world class cruises. Bermuda, with its pleasant weather and lush vegetation, comprises nearly 180 islands in the Atlantic Ocean. Bermuda boasts of pink sandy beaches and dazzling turquoise waves. A Bermuda cruise is a wonderful way to experience this exotic locale. Find out how you can plan a Bermuda holiday. Bermuda lies in the Atlantic Time Zone and is one hour ahead of New York. It is situated at a distance of 650 miles from North Carolina. Flights from New York and other eastern cities take less than 2 hours to reach Bermuda. Air Canada, American Airlines, British Airways, Continental Airlines, Delta Airlines, United Airlines and US Airways operate regular flights from major US Cities to Bermuda. English is the official language albeit spoken with a lilt. Portuguese is also widely spoken and understood. Rental cars are not available in Bermuda, primarily to protect the island from traffic and pollution. Taxi, bus, ferry, scooter and carriages are available in plenty to cater to tourist requirements. Taxis are another mode of transport within the island and most of the taxi drivers also double up as tourist guides. All taxis are metered and rates are higher between midnight and 6am and on holidays. Local buses, painted pink with blue stripes, also cover the entire island and have frequent services. During the summer months from May to November, you need lightweight summer clothes, swimsuits, raincoats and windbreakers during daytime. For the evenings, you need light dressy sweaters, casual cottons, sports jacket and tie. For a Bermuda holiday from December to March, you need to pack light woolens, sweaters, raincoat, windbreakers or coat. You can reserve the swimsuit for the daytime activities. Do carry along a pair of sturdy walking shoes, a pair of flip flops and sun protection gear. Looking for accommodation in Bermuda? Bermuda offers a variety of accommodation including bed and breakfast establishments, cottages, suites, apartments, cottage colonies and resort hotels. Bed and Breakfast are family-run affairs and tourists can enjoy authentic island living in Bermuda homes. Inns are comparatively more comfortable featuring swimming pools and other amenities. Some inns also provide kitchen facilities. Cottages and apartments are located on landscaped estates, having their own pools and ocean views. Cottage colonies are unique to Bermuda and offer in-house lounge, bar, pool, beach, club house and dining room. Resorts hotels in Bermuda offer you fine dining, spa, pool, own beach, evening entertainment, clubs, sporting facilities in addition to other basic amenities. Bermuda boasts of a number of spas offering seaweed wrap, aroma massage, holistic therapies, Reiki, sauna and steam bath, hot stone treatments and herbal wraps. Churches and Forts: An interesting fact about Bermuda is that it has the highest number of churches per capita than anywhere else in the world. Tourists can visit the Anglican Cathedral, which has a 157-step tower and boasts of a fantabulous view from it. The St. Peter's Church was built in 1612 from Bermuda cedar and is a must see. Bermuda is also dotted with number of forts, all built by the British. All the forts were built of stone and offer visitors glimpses of military history as well as ocean views. Some forts also have parks, moats and museum and gift shops. The Botanical Gardens: This botanical garden covers 36 acres and includes a palm garden with native palmetto trees, a garden for the blind, a subtropical fruit garden, greenhouses, an aviary and a miniature forest. The Camden House, which is the official residence of Bermuda's Premier, is also located within the garden. It is open for tours except during official engagements. Palm Grove Gardens: This is a private garden but has been opened to the public. It has well-manicured gardens, an aviary, citrus groves and sea vistas. It also has a natural map of Bermuda set in a small pond. Bermuda Maritime Museum: This museum is located within a fortress at the edge of the Royal naval Dockyard. Visitors can take a tour of the Commissioner's house, which happens to be the first prefabricated cast and wrought iron house in the world. One can also have a look at the exhibitions featuring Bermuda Slavery, Bermuda's maritime history and Portuguese ancestry. The Dolphin Quest program is also very popular. Royal Naval Dockyard: This dockyard was built by slave and convict labor and it became a strategic outpost for the British Royal Navy a couple of centuries ago. During the war of 1812, British warships set sail from this dockyard to attack Washington. Many of the old buildings have been converted into restaurants, shops, arts and crafts workshops. You can also explore former military structures and underground chambers. Children can also take part in the interactive exhibits at the Children's Museum. Dockyard Glassworks: This is a hot glass studio holding glassblowing and flame working demonstrations daily. Bermuda is packed with a number of lovely beaches and as it is an island, you can never be very far from the sea. Swimming, fishing, cruising, parasailing, water skiing, body surfing, snorkeling, kayaking and of course sun-bathing are some of the activities you can enjoy at the beaches. Body boards, kayaks, snorkel masks, fins, umbrella, lounge chairs can all be rented at the beach itself. Bermuda beaches also have snack bars selling drinks and eateries. Some of the remote beaches do not have all these facilities but the seclusion and astounding views make up for it. You can cruise around the islands of Bermuda in luxurious settings aboard a cruise liner and also enjoy onboard activities. You can cruise along to Hawkins Island, Cococay and Labadee. Onboard activities include ice skating, karaoke and talent shows. Shore and land excursions include sightseeing, exploring ancient ruins, shopping, fishing, playing golf and tennis or lounging about on the pink sand beaches. Typically Bermuda cruises run seasonally from April to November. You can take a Bermuda cruise from Boston, New York, Philadelphia, Baltimore or Fort Lauderdale. You can experience the crystal water and pink beaches aboard a luxury liner. Whether on board a cruise or exploring the island, Bermuda has plenty to offer including theater companies, dance troupes, musical performances and theaters screening the latest block busters. And its proximity to the East Coast of US makes it an ideal destination for holiday makers.